The 2018 United States House of Representatives elections in Kansas were held on November 6, 2018, to elect the four U.S. Representatives from the state of Kansas, one from each of the state's four congressional districts. The state congressional delegation changed from a 4–0 Republican majority to a 3–1 Republican majority, the first time the Democrats held a house seat in the state since 2010. The first district is one of the largest geographically in the nation, encompassing more than half of the area of the state. It is located in western and northern Kansas, and includes the cities of Manhattan and Salina. Republican Roger Marshall won this district in 2016 by defeating the incumbent Congressman, Tim Huelskamp, in the Republican primary 57% to 43% and winning the general election. Former school administrator Alan LaPolice, who previously ran as a Republican in 2014 and an independent in 2016, filed to run as a Democrat. Tim Huelskamp filed a statement of candidacy with the FEC on October 17, 2016, to run for this seat in 2018. Huelskamp made no announcement about whether he is considering a potential rematch with Marshall, but sent a fundraising email attacking Marshall and soliciting donations. On June 29, 2017, it was announced that Huelskamp had accepted a position with The Heartland Institute, a conservative think tank in Arlington Heights, Illinois. This district is located in eastern Kansas and is anchored by the state capital, Topeka. It also includes the city of Lawrence. Incumbent Republican Lynn Jenkins has represented the district since 2009. Jenkins was re-elected with 61% of the vote in 2016. Jenkins had considered running for governor instead of re-election, but decided to retire and not run for any office in 2018. Former Kansas State House Minority Leader, Blue dog Democrat and 2014 gubernatorial nominee Paul Davis ran unopposed, for the seat which retiring Republican Lynn Jenkins held since 2009. She had beaten former six-term District congressman Jim Ryun in the primary, and incumbent Democrat, Nancy Boyda, in the general election. When Davis ran against incumbent governor Sam Brownback in 2014, he carried the district. Before Ryun won the seat, it had been held by retiring Democratic Representative Jim Slattery. He left Congress and ran unsuccessfully in the 1994 election for the Kansas Governorship, against Republican Bill Graves. Although Watkins had his residency challenged by other Kansas Republicans, he remained on the ballot. On October 2, 2018, the Associated Press released a story that questioned not only his residency, but numerous inconsistencies in the background he claimed. He alleged that he had provided substantial assistance to those who had suffered from the results of the April 2015 Nepal earthquake, but there was no evidence of that. He claimed he had lived in Alaska, but returned to Kansas to run, but he owned two homes in Alaska, yet did not apparently live in either. He collected a Permanent Fund Dividend, which is only given to eligible state residents. Longtime resident and business developer Kelly Standley filed the necessary paperwork with the Federal Election Commission as a Libertarian candidate. The district is based in the Kansas City metropolitan area and surrounding suburbs in eastern Kansas. Cities include Kansas City and Overland Park. Incumbent Republican Kevin Yoder had represented the district since 2011. Yoder was re-elected with 51% of the vote in 2016. Yoder lost to his Democratic challenger, attorney Sharice Davids, who became one of the first Native American women ever elected to Congress. The fourth district is based in southern Kansas, including Wichita and the surrounding suburbs. Incumbent Republican Ron Estes has represented the district since 2017. Estes was elected with 52.5% of the vote in 2017. Prior to Estes, Mike Pompeo represented the district. Pompeo had been nominated as Director of the Central Intelligence Agency in the Donald Trump administration. After Pompeo was confirmed, a special election was be held for the remainder of Pompeo's term. Ron Estes won the special election on April 11, 2017. The Republican Party selected a nominee during a Republican Party primary election which took place on August 7, 2018. The Republican primary was open to registered voters who were either unaffiliated or registered as Republicans. Kansas Senate President Susan Wagle considered making a primary challenge of Estes, but declined to do so. Because there were two Republican candidates named Ron Estes, the names will appear on the ballot as "Rep. Ron Estes" and "Ron M. Estes", which some criticized as breaking state law that prohibits identifying an incumbent on the ballot. The Democratic Party selected a nominee during a Democratic Party primary election that took place on August 7, 2018. The Democratic primary was open to registered voters who were either unaffiliated or registered as Democrats. Senator Bernie Sanders and Alexandria Ocasio-Cortez campaigned for Democrat James Thompson on July 20, 2018, after the national Democratic party would not support him. Laura Lombard criticized the state's decision to list incumbent Ron Estes as "Rep. Ron Estes" on the ballot, because she believes it breaks state laws which prohibit a candidate from being identified as an incumbent on the ballot. ^ Beets, Jason (May 30, 2018). "LaPolice files to run for U.S. House". Hays Daily News. Retrieved June 1, 2018. ^ a b Clarkin, Mary (October 27, 2016). "Huelskamp files 2018 House candidacy paper". The Hutchinson News. Retrieved November 18, 2016. ^ Carpenter, Tim (June 29, 2017). "Huelskamp takes job at conservative institute in Illinois". The Topeka Capital-Journal. Retrieved September 30, 2017. ^ Hanna, John (November 18, 2016). "Rep. Jenkins exits U.S. House leadership, may mull Kansas governor's race". Lawrence Journal-World. Retrieved November 18, 2016. ^ "Lynn Jenkins Won't Seek Any Political Office in 2018". Roll Call. January 25, 2017. Retrieved February 9, 2017. ^ Ranney, Dave (November 8, 2006). "Democrats dominate". Lawrence Journal-World. Retrieved September 3, 2018. ^ Carpenter, Tim (April 13, 2017). "Democrat Paul Davis initiates campaign for Rep. Lynn Jenkins' 2nd District congressional seat". The Topeka Capital-Journal. Retrieved April 19, 2017. ^ a b "Kansans for Life PAC – 2018 Statewide Primary Endorsements". Kansans for Life. July 6, 2018. ^ "Caryn Tyson on Twitter". Twitter. Retrieved July 16, 2018. ^ "The Madison Project Endorses Caryn Tyson in KS-2". Madison Project. Retrieved July 16, 2018. ^ "Maggie's List Announces 2018 National Endorsements Supporting 49 Women Candidates Running for US Congress and Statewide Executive Office". Maggie's List. Retrieved July 16, 2018. ^ "Nat'l Pro-life Group Endorses Caryn Tyson for KS-02 Open Seat". Susan B. Anthony List. Retrieved July 16, 2018. ^ The Associated Press (August 1, 2018). "Freshman Rep. Roger Marshall endorses Steve Watkins in Kansas 2nd District race for Congress". The Topeka Capital-Journal. ^ With Honor. "Congratulations to Steve Watkins for Congress #KS02. We are proud to have endorsed such a principled veteran". Facebook. ^ Kansas congressional candidate who ran the Iditarod is having his honesty challenged, Anchorage Daily News, Roxana Hegeman and John Hanna (AP), October 2, 2018. Retrieved October 3, 2018. ^ Lowry, Bryan (February 15, 2018). "JoCo lawyer hopes to be first Native American woman in Congress, first gay Kansas rep". The Kansas City Star. ^ Woodall, Hunter (July 6, 2017). "Prairie Village teacher announces bid for Kevin Yoder's congressional seat". The Kansas City Star. Retrieved July 6, 2017. ^ Lowry, Bryan; Wise, Lindsay (April 12, 2017). "Wichita race should be a warning for Kevin Yoder, other Republicans, strategists say". The Kansas City Star. Retrieved April 19, 2017. ^ Jacobs, Ben (July 24, 2017). "Sanders loyalist who 'struggled' to vote for Clinton to run for Congress in Kansas". The Guardian. Retrieved July 24, 2017. ^ a b c Lowry, Bryan (June 13, 2017). "Iraq War veteran ends campaign for Congress after Leawood attorney jumps into race". The Kansas City Star. Retrieved June 15, 2017. ^ "Chris Haulmark on Twitter". ^ Lowry, Bryan (May 22, 2017). "Iraq War veteran pursues run for Yoder's seat, sets up likely Democratic primary fight". The Kansas City Star. Retrieved May 24, 2017. ^ "Kansas Dem Andrea Ramsey, accused of sexual harassment, will drop out of US House race". The Kansas City Star. December 15, 2017. ^ "Carol Marinovich endorses Tom Niermann in congressional race". February 8, 2018. Retrieved July 3, 2018. ^ a b c d e f g h i j k l m n o p q r s t u v w x y z aa ab "Endorsements – Brent Welder for Congress". www.brentwelder.com. ^ Herbert, Danedri (October 30, 2017). "Social Justice Radical Endorses Welder in Kansas Congressional Race - The Sentinel". ^ "Congressional Progressive Caucus PAC Announces Slate of House Endorsements - Progressive Caucus". March 22, 2018. ^ "Our Revolution and PCCC endorse Brent Welder for Congress". Our Revolution. ^ All other candidates poll under 5% individually. ^ "Kansas' 3rd Congressional District election, 2018". Ballotpedia. Retrieved February 22, 2018. ^ Laura Kelly. ". @sharicedavids is smart, tough and dedicated to representing all Kansans. I'm looking forward to working together to bring change to KS!". Twitter. ^ a b c d e f g Davids, Sharice (July 27, 2018). "THREE PRAIRIE VILLAGE CITY COUNCIL MEMBERS ENDORSE SHARICE DAVIDS IN KANSAS THIRD" (PDF). ^ Kathleen Sebelius [@Sebelius] (August 8, 2018). "Please join me in supporting @sharicedavids.She's smart, policy oriented, and pragmatic.She gets what working people are going through bc she's lived it.DC desperately needs representatives who will get things done for KS families.Rep. @kevinyoder is more about his donors than us" (Tweet) – via Twitter. ^ Orellana, Andres (June 28, 2018). "CHC BOLD PAC Announces New Endorsements". The Beat DC. ^ Lujan, Ben Ray (August 10, 2018). "DCCC CHAIR LUJÁN RECOGNIZES SHARICE DAVIDS AS PART OF 'RED TO BLUE' PROGRAM - DCCC". DCCC. Democratic Congressional Campaign Committee. ^ Woodall, Hunter (May 24, 2018). "Emily's List endorses another Dem in Kansas' 3rd District after first candidate drops out". kansascity.com. ^ Rickert, Levi (August 22, 2018). "END CITIZENS UNITED BACKS SHARICE DAVIDS FOR CONGRESS". nativenewsonline.net/. Native News Online. ^ Byrne, Robert (June 26, 2018). "Victory Fund Endorses 37 More LGBTQ Candidates for 2018". LGBTQ Victory Fund. ^ Sittenfeld, Tiernan (September 4, 2018). "LCV Action Fund Endorses Sharice Davids for Congress - League of Conservation Voters". League of Conservation Voters. ^ Sandberg, Stephanie (July 9, 2018). "LPAC Endorses New Slate of Candidates - LPAC". LPAC. ^ Lack Sinclair, Alex (March 7, 2018). "A Native-American Lawyer | An Ebola-Battling Physician | A Pioneering Economist | A Life-Saving EMT | Meet Our Newly Endorsed LGBTQ+ Congressional Candidates". Run with Pride | Electing LGBTQ+ Candidates to Congress. ^ "Sharice Davids is Kansas Democrats' best choice for Congress in the 3rd District". kansascity. The Kansas City Star Editorial Board. the Kansas City Star. August 3, 2018. ^ Lowry, Bryan; Wise, Lindsay (July 3, 2018). "Vice President Mike Pence headed to KC area to raise money for U.S. Rep. Kevin Yoder". The Kansas City Star. ^ Donald J. Trump. "Thank you to Congressman Kevin Yoder! He secured $5 BILLION for Border Security. Now we need Congress to support. Kevin has been strong on Crime, the Border, the 2nd Amendment, and he loves our Military and Vets. @RepKevinYoder has my full and total endorsement!". Twitter. ^ Lefler, Dion; Dunn, Gabriella (November 18, 2016). "Who could replace Pompeo in Congress?". The Wichita Eagle. Retrieved November 18, 2016. 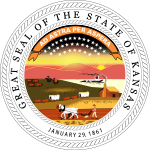 ^ "2017 Unofficial Kansas Election Results". www.sos.ks.gov. Retrieved April 12, 2017. ^ a b Legislatures, National Conference of State. "State Primary Election Types". www.ncsl.org. Retrieved July 27, 2018. ^ a b FairVote.org. "Primaries – FairVote". www.fairvote.org. Retrieved July 27, 2018. ^ "Wagle run for Congress would mean primary challenge for Estes". kansas. Retrieved July 27, 2018. ^ "Susan Wagle, Senate president, rules out bid for Congress or governor". kansas. Retrieved July 27, 2018. ^ "Kansas to use 'Rep' to distinguish candidate with same name | WTOP". WTOP. June 11, 2018. Retrieved July 27, 2018. ^ a b KWCH. "Second 'Ron Estes' releases statement in 4th congressional district race". Retrieved July 27, 2018. ^ Garcia, Eric; Garcia, Eric (June 12, 2018). "Rep. Estes Gets to Be 'Rep. Estes' on Kansas Primary Ballot". Roll Call. Retrieved July 27, 2018. ^ Smith, Sherman. "In Ron Estes vs Ron Estes, Democrat wants 'Rep' left off ballot". The Topeka Capital. Retrieved July 27, 2018. ^ Shaar, Deborah. "It's Estes Vs. Estes In 4th Congressional District GOP Primary". Retrieved July 27, 2018. ^ "Ron M. Estes has a brilliant plan to defeat Ron G. Estes in a Kansas congressional race". July 20, 2018. Retrieved July 27, 2018. ^ Gardner, Josh (July 20, 2018). "Longshot's Campaign Has One Unusual Advantage". Newser. Retrieved July 27, 2018. ^ a b Smarsh, Sarah (July 26, 2018). "They thought this was Trump country. Hell no". The Guardian. ISSN 0261-3077. Retrieved July 27, 2018. ^ Weigel, David. "Bernie Sanders and Alexandria Ocasio-Cortez will campaign together in Kansas". Washington Post. Retrieved July 27, 2018. ^ "From New York to the Heartland: Ocasio-Cortez Debuts on National Campaign Stage". The New York Times. Retrieved July 27, 2018. ^ "Bernie Sanders fires up 4,000 in Wichita with rally for James Thompson, against Trump". kansas. Retrieved July 27, 2018. ^ "Democrat Laura Lombard launches campaign for Congress". kansas. Retrieved July 27, 2018. This page was last edited on 18 March 2019, at 23:21 (UTC).